Today, I am going to talk about terms and rules of slot games used in EOSreel. 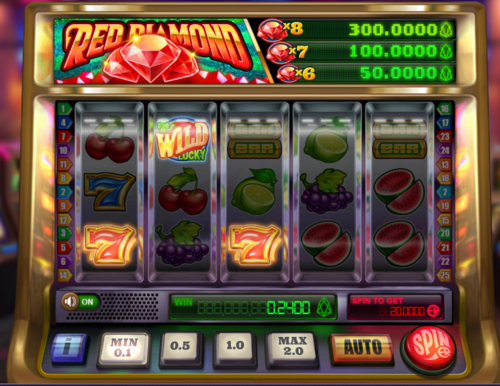 As our first game, Red Diamond, is a slot game, the rules and terms of the game may not be very familiar to someone. 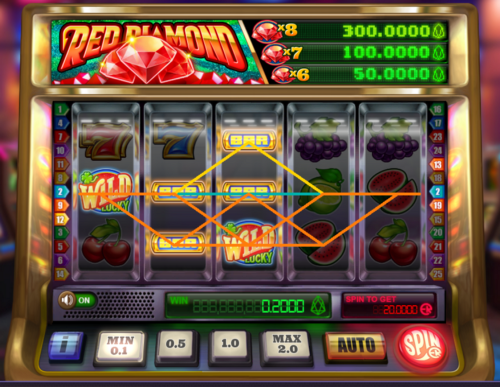 The compositions of Red Diamond are not much different from traditional slot games. Balance : The amount of EOS in your account for use of Red Diamond. Display box : The box that shows how much EOS you win and ER you mine. Paylines : The lines you play with the next spin. Paytable : A table that shows what lines you can win. Total bet : Bet per line X the number of paylines. 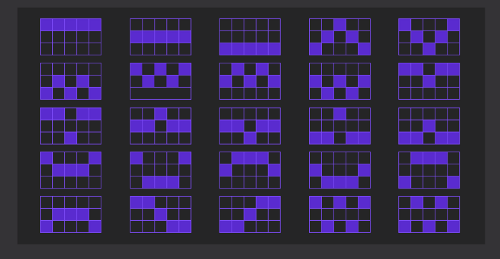 Reel : Parts of slot machine that shows symbols and spins. Green EOS on left side shows EOS in your account. Red one on the right side shows ER that you have mined within Red Diamond. You can check out how much you win with display box. The green box on the left shows you the amount of winning rewards, and the red box shows you the amount of ER you would mine if you hit ‘SPIN’. The green numbers, of course, will appear after spin is over. Paylines are the lines in which payouts will be awarded based on the winning combinations. You can check out EOSreel’s paylines in Pay-Table. If place bets on Red Diamond, it means you place bet for all 25 paylines that are shown in the picture above. If a combination of symbols fits each payline, it will generate a line payout. And the proportion of rewards will vary depending on the number of symbols that make up the combination. 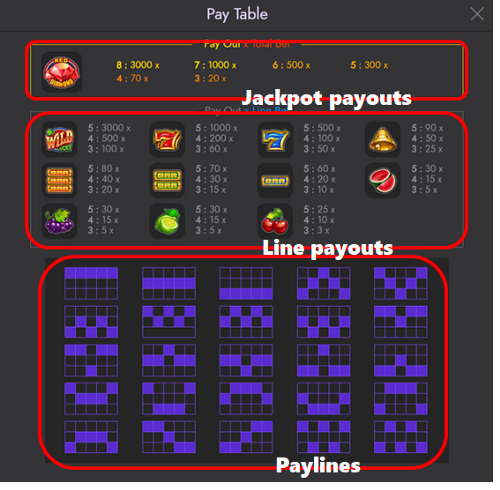 Paytable shows the detailed information of jackpot payouts, line payouts, and paylines. 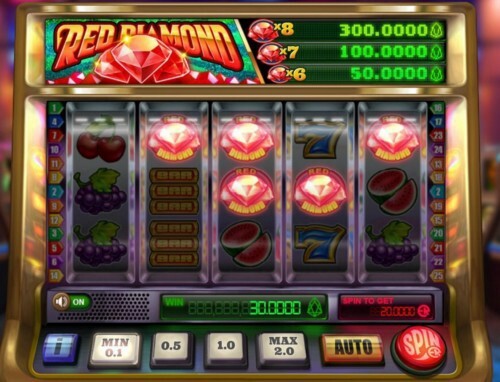 The amount of jackpot payout only depends on the number of Red Diamonds on the reels. Lines do not matter for this. Line payouts are the payouts from paylines. Users are betting on all 25 paylines in EOSreel. Simply put, if you bet 1 EOS, that means you bet 0.04 EOS on all 25 paylines. So, if you get three Red Seven symbols on only one line, the winning reward will be 2.4 EOS(0.04x60). *0.24 EOS is shown on that picture because I placed bet with 0.1 EOS. Total bet means sum of all 25 line bets. The bets you place in Red Diamond are all total bets. 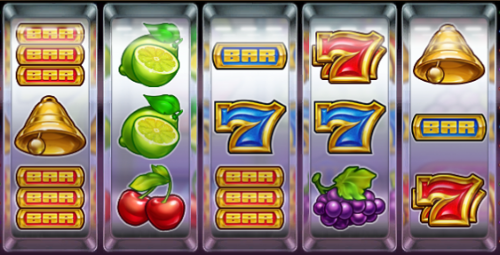 On a slot game, the reels are what the player spins to make winning combinations. These might be mechanical wheels inside a slot machine, or virtual reels on the digital screen of a video slot games. Players wager on a spin of the reels and win or lose based on the outcome of that spin. Simple betting games might have a single reel, but most mechanical games have three reels and most video slot games have five reels.